We specialise in making memorial plush toys to help with the loss and grief you feel after losing your beloved pet. 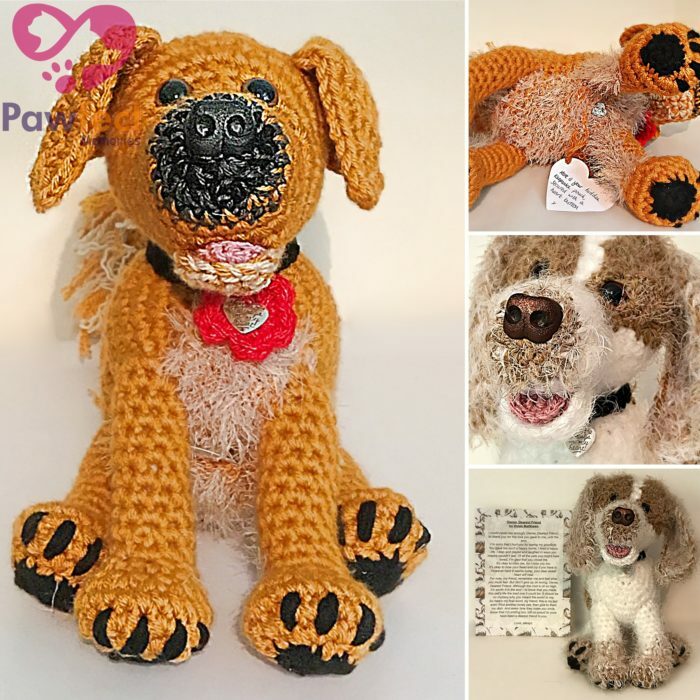 Each toy will be carefully and thoughtfully handmade to replicate the details of your beautiful pet, including a special memorial pocket for your pets keepsakes, such as ashes, teeth, fur and photos. 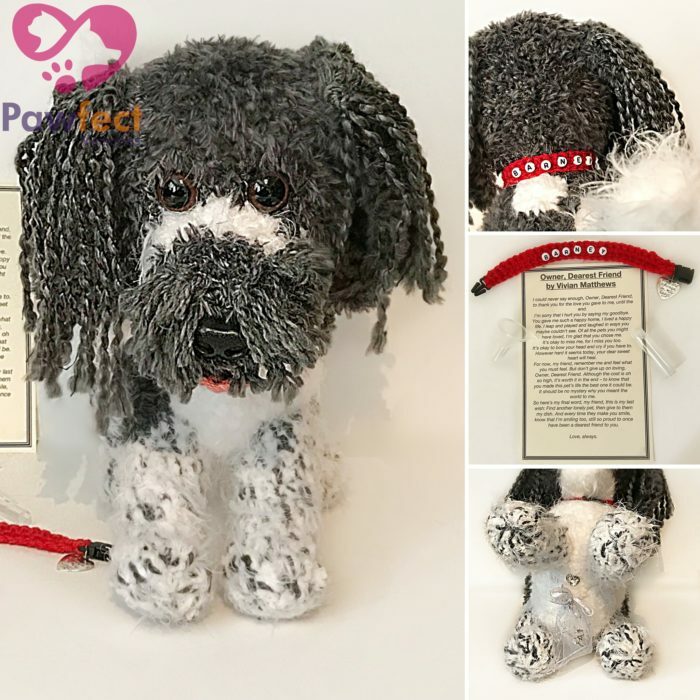 Keepsake Pawfect Memories Plush Choose an optionA specialist keepsake item featuring a pouch for your precious treasures. At Lovingly Handmade Crochet, we want to help make this process easier and offer a real and tangible comfort to those who have lost their furry babies and family members. Each Lovingly Handmade Crochet keepsake plush will be made with the utmost care and respect. We will carefully recreate all the special details of your pet and ensure it is as close to perfect as we can make it! Each keepsake plush will include a special poem, a memorial collar (in a colour of your choice), and a keepsake pouch on your pets tummy, offering a special and secure place to store special memories or a small vial of ashes. Keepsake plushes are NOT toys. These are ornamental items and may include small pieces and parts unsuitable for children. Each one is made to order from photographs of your pet that you upload when you place your order. We understand that this may be more difficult with pets that have passed away, so please just try to show as many details as you can, as close to the required photos as possible. To send additional photographs please email us at: enquiries@lovinglyhandmadecrochet.co.uk and quote your order number. To complete your order, we will need photographs of the left/right sides of your pet, the front and rear, the belly and back, as well as paws, claws or feet, as well as a face closeup. You should also try and send any other pictures that show the special details that make your pet unique and special to you! We can only include the details we can see, or that you tell us about! Results are therefor dependent on the level of detail in the information you provide us with. A specialist keepsake item featuring a pouch for your precious treasures. Hi there. I just wanted to message and personally thank you very very much for how true to Pipers likeness that the crochet dog is. Myself and all the family are so so pleased with it. Sadly piper passed away just recently and so it was an emotional gift to say the least- because of how well it has turned out. I am so thankful for the effort made with the collar, means the world to us. Now we have ‘Piper’ sitting ontop of the fireplace warm and toasty where she belongs. Thank you and thank you again! You have done an absolutely wonderful job making our beautiful Newfoundland Bailey for us. Our daughter is taking him to university with her as she wouldn’t be without him. We all miss him so much and we can’t Thankyou enough. Dear Laura & Riccardo I just wanted to send a massive thank you for our beautiful crocheted pup. The first words we said when we opened the box was WOW, firstly we couldn’t believe how big it was and how lovingly handcrafted it actually was. Of course it had added emotion as it was in memory of our beloved Holly that we lost last year, but she has been beautifully captured and for that We can’t thank you enough.